Today is Day #171 of the Just For Today Challenge. I am also integrating the Live Happy into my daily Challenge. 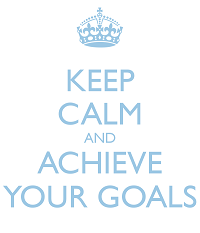 The Live Happy Challenge for today says, establish attainable goals first. 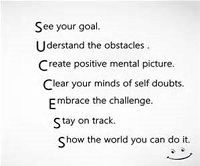 When you have decided that success is possible and have worked you inner game (that is, being able to think of yourself as successful), then it's time to establish some modest, attainable goals. Reaching for too much too soon might render disappointment if you aren't immediately successful. Starting out with some attainable goals will increase your confidence and inspire you to even greater accomplishments. I believe this is true. I've told my kids that they should list their small goals first; those they know they can attain. When you see you can get to the small ones soon you'll feel nothing can stop you now. Then, you will strive to get to the harder goals or those that seem less attainable. Just For Today: I will strive to attain to my smallest goals first. I am very excited this morning. After checking my email I found a notification of the April A-Z Blog Challenge. I haven't participated in a couple of years and when I did it was on another blog. I am excited to tell you that I am participating this year on this blog. My theme for this year to be announced a little later, but I guess it isn't hard to figure it out, huh? 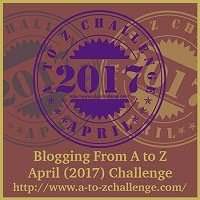 in the April 2017 Challenge please visit their page @ Blogging From A-Z for more information. For those who have participated in the challenges, they have released this years A-Z Team members as well. To those wishing to participate on your blog, remember to bookmark their page because on February 6th an important post will come out relating to this years challenge. Today is Day #170 of the Just For Today Challenge. I am also integrating the Live Happy into my daily Challenge. The Live Happy Challenge for today says, devise spinoffs of the dream you wish to pursue. Consider how you might do what one television infomercial guy did, that is, spinning your dream along different avenues. The television guy speaks passionately about his love of real estate wheeling and dealing, updating houses he buys cheap through foreclosures, bank owned real estate auctions, or tax sales. He flipped those houses into a million-dollar income, but he didn't stop there. He spun his dream into books, seminars, conferences, a television show, and other areas that cross-sold his real estate ideas. Your interest might not be in real estate or lend itself to exactly those types of spinoffs, but think of how you, too, could develop spinoffs from your dreams. Have you ever had a dream of doing something or becoming something? 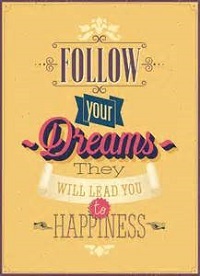 Just For Today: Following dreams will lead to happiness. 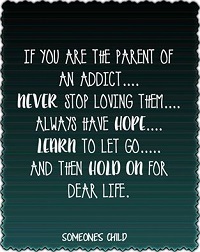 It is no big secret to those who know me personally that I am the mother of a child who was addicted to drugs. He is several months into his recovery from heroin and opioids, Xanax and whatever else he could get into his veins compliments of the local street pharmacy. Today is Day #169 of the Just For Today Challenge. I am also integrating the Live Happy into my daily Challenge. The Live Happy Challenge for today says, visualize achieving your goal three times a day. What's your primary personal goal? Is it to lose weight? Spend less money? Or maybe earn more money? From now on at mealtimes I will eat one third less than my usual serving of food, and I will walk a half-hour each weekday. Try to keep your affirmation succinct and to the point. That way, it will be easy to recall, and repeat it at least three times during the day. The more specific your affirmation, the more effective it will be in helping you attain your goal. Just For Today: Today, I am happy. Today I am healthy. Today I am Blessed. Just in case here is a link to Daily Affirmations or you can think of your own to use. As part of drug facts week I am ending this week with the memories of those who are gone too soon from this disease. 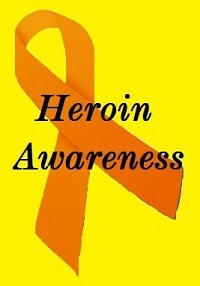 We have to always remember those are gone too soon from the disease of addiction. And always remember to speak their names. To them, I light a candle. The challenges for the section on Be Happy on the Road have come to an end. I hope you found something interesting in the challenges of Happiness on Road and some ideas to help when you travel whether it is around the United States or for those of you who travel outside of our country. The next section of challenges are about Finding Happiness Pursuing Your Dreams. Now, all of us have dreams especially dreams of something we'd like to do one day. One of our sons has a dream of flipping houses. I would love to win the lottery to help get him started on his dream. He's very talented and would do well. I personally would like to take a few of my hobbies and make an income. The hubby's dream is to homestead and live off grid. We all have dreams of doing something one day. 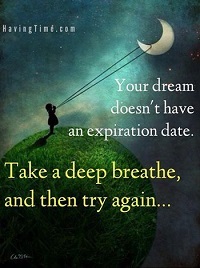 It is never too late to pursue any dream you have! The next set of challenges hopefully will give everyone ideas on pursing our own dreams. I peeked ahead at a few of them and there are some really good ideas. There are so many brilliant minds here in the panhandle and so many young and future innovators. Remember, anything is possible- even your dreams! I have called upon a local entrepreneur for his help and guidance over the next few days of these challenges and for his input. If you are searching for Happiness in Pursuing your dreams and you have dreams, but you just don't know where to start locally reach out to local entrepreneur, Winchester Hopkins. Winchester spends time working with oppressed individuals through his nonprofit organization, Self Empowerment Institute Inc. Remember I said a few weeks ago that I have saved bits of stories and ideas for posts just setting in my draft folder? I found this among them. It was saved from a Facebook Group post some months back and is definitely worth mentioning and of course they said share it. 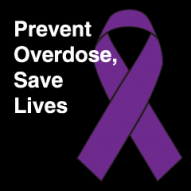 This is National Drug Facts Week. 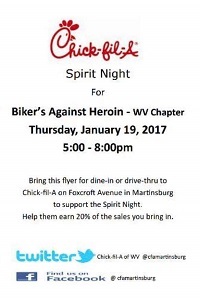 What better way to end the week than to tell you that this addiction isn't a fairy tale and to share something that is real about heroin and addiction. Today is Day #167 of the Just For Today Challenge. I am also integrating the Live Happy into my daily Challenge. The Live Happy Challenge for today says, don't forget to tip the hostess, and the housekeeping staff. No one enjoys picking up dirty, wet towels and cleaning sinks and showers of soap scum, whiskers, and hair. When you are working out the budget for your trip, try to include tips for the household workers who keep your home away from home clean, sanitary, and fresh. Housekeepers and motel workers make very little money, yet their work, in addition to being tedious and dirty, is often thankless. Your tip will help them better provide for their families and tells them that you have appreciated their work. And you can feel happier knowing that your act may change the ugly American perception by some foreigners to a view that Americans are friendly, caring, and generous. I worked for a couple years in hospitality and it's definitely a thankless job. It seems that no one tips anymore. Here in the states housekeeping staff in many places are only paid minimum wage (at least we were where I worked). Waitresses are often only paid a half of minimum wage and rely on tips to make up the rest of their wages. Just For Today: I am happy helping others- even if it is only a small token of a form of kindness. 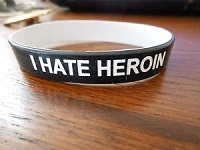 addiction, specifically addiction to heroin and opiates. Today is Day #166 of the Just For Today Challenge. I am also integrating the Live Happy into my daily Challenge. The Live Happy Challenge for today says, pack your favorite herb tea, herbal soothers, medicine and personal products. If it's pouring rain in Paris and you forget your umbrella and end up with a nasty cold on the way back from walking to the Notre Dame, most likely, you aren't a happy traveler. Likewise when those monthly cramps begin the moment you set foot on the beach in Jamaica in your bikini. Anticipate times during your upcoming trip when you might not feel well. Before you go, pack those personal items such as tea, medicines, and other products that will comfort you and make you feel better when you are away from home. Just For Today: The simple things make all the difference. 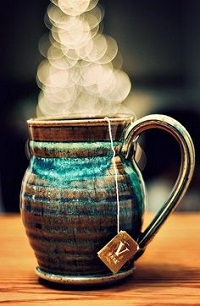 There is nothing like a nice cup of my favorite herbal tea when I am feeling down. 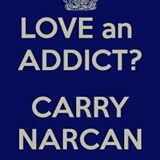 One of the things we on this side wish is that not one other person would be affected by the disease of addiction. And, not one other family would suffer. Sadly, I don't see that happening as the numbers of our local statistics continues to climb. We wish not one other parent would ever have to stand back and watch their loved one struggling with this disease and unable to do anything but watch as their life is destroyed. 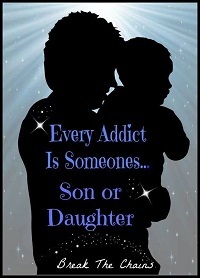 We wish not one other family would know the stigmas associated with the disease of addiction. 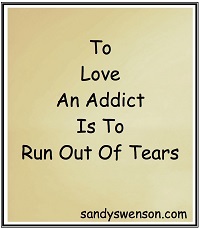 This pretty much says it all about loving someone with the disease of addiction. Throughout this blog I have shared some of my own personal journey and the struggles of loving a son with the disease of addiction. Today is Day #165 of the Just For Today Challenge. I am also integrating the Live Happy into my daily Challenge. The Live Happy Challenge for today says to exchange addresses and email addresses and stay in touch with someone we met and became friends with on a trip. Nothing brings back memories of your trip like receiving mail from friends you made while on vacation. But if they don't know how to contact you once you've left them, you won't be getting those photos they took of you during your visit, the piece of art they promised to send, their postcards or letters. So, don't forget to exchange your mailing address and email address with families and friends you met while traveling. You'll enjoy memories of that trip all over again when they contact you. And, if you are lucky, you'll be invited back again next year. Several months ago I told you that while camping in Hardy County, WV we ran into a friend from back home. We had lost touch with him over the years. It turns out he moved to Hardy County. We connected with him and have stayed in touch. Just For Today: Keeping in Touch with those we lost connections with. One question that seems to always get asked and I know I've asked the same question. That question is, How Did This Start in the First Place? But, as with everything it starts somewhere doesn't it? Today is Day #164 of the Just For Today Challenge. I am also integrating the Live Happy into my daily Challenge. The Live Happy Challenge for today says, when traveling invite a fellow traveler to dinner at a local café. If you bump into someone you recognize from the airport, on a local bus trip, or from the lobby of your hotel, invite them to dine with you. Traveling solo can be lonely at times and the camaraderie of new friends can lift your spirits. Your fellow traveler may be craving company as much as you are. Some experiences are best enjoyed with another person. If you go to Ireland, for example, with an urge to bike around the southern part of the Emerald Isle to see the Ring of Kerry and the Cliffs of Mohr, having a fellow traveler along might provide the impetus to just go for it. You buy or rent some bikes in Dublin and head off into the biking trip of a lifetime, then share stories about it in the local pub when it's over. Now how fun could that be? Just For Today: Remembering the good times spent with friends. 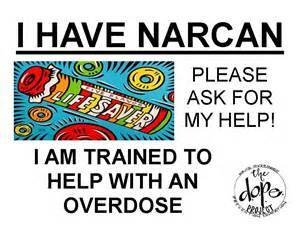 This post is part of the National Drug Week. What better way to start the week then to provide you with some of the facts. 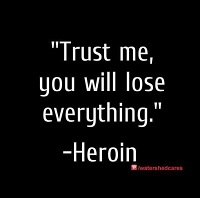 The heroin epidemic affects every state in this country. It affects every town and every city in the U.S. of A. Today is Day #163 of the Just For Today Challenge. I am also integrating the Live Happy into my Challenge. The Live Happy Challenge for today says, when somewhere new explore an interesting street or path. Sometimes, the most memorable places you'll find while on vacation are the little discoveries you made off of an alley, down an interesting side street, or along a side path that lead to a river's edge, a shady courtyard, or a butterfly garden. Explore the neighborhood where your accommodations are located. Drive to a nearby town or village and sample their foods and wines. Discover a deserted hill town. 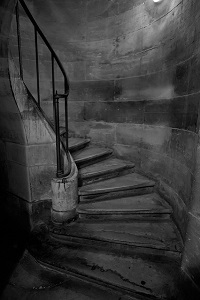 Or make your way to what appears to be a palace of bygone era. Take off with your walking stick into the hill country. Discover places beyond the familiar path that will make your trip unique and special. In exploring you never know what you will find. We always camp in The George Washington National Forest. Once when hiking the trails we took a different path and stumbled on a small brook running through the forest. Years later when hiking we have been unable to find that same spot. Just For Today: I am ready for spring and ready to get out and explore! Last week I received an email from Jackie Cortez of Prevention Coalition. What a great way to start the National Drug Facts Week off than to share some valuable links? It starts with prevention. It starts with more parental awareness. Prevention starts in the home, in the schools, in the churches, in the clubs. Community Advocate, James Boyd held a meetup on Friday evening, January 20, 2017 at the Community Recovery Resource Center with various groups in the community fighting against the heroin epidemic. James Boyd's message of #staystopped is part of his Advocacy of Change here in our community. Those present were Tina Stride, Lisa Melcher and Tara Mayson of The Hope Dealer Project. Dee Stotelemyer Pierce was also present at the meetup representing the group, Bikers Against Heroin. Winchester Hopkins, local entrepreneur and founder of the nonprofit organization, Self Empowerment Institute Inc. was also present at the meetup. Also present was Community Recovery Services Coordinator, Kevin Knowles. The purpose of this meetup was to bring the different groups together in one place to build unity among them. They also started planning for a future fundraiser which is being planned for later in 2017. I will have more details about this in the coming months. 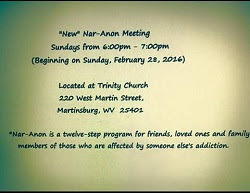 The Community Recovery Resource Center is located at 400 W. Stephen St in Martinsburg, WV. 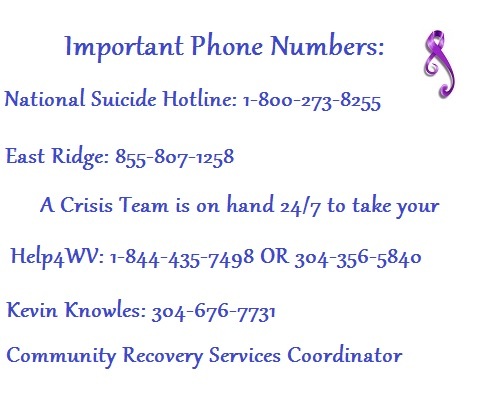 Community Recovery Services Coordinator at 304-676-7731. 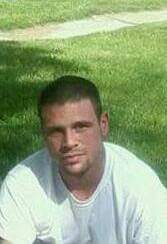 If you are struggling in recovery or struggling with changing your addiction feel free to message Mr. James Boyd on his Facebook or contact Bikers Against Heroin. They will put you in touch with someone that will help. 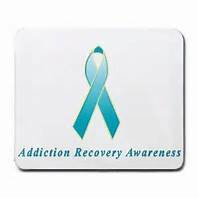 You can also find more information on Treatment and Recovery Assistance by clicking the link provided here. Today is Day #162 of the Just For Today Challenge. I am also integrating the Live Happy into my Challenge. 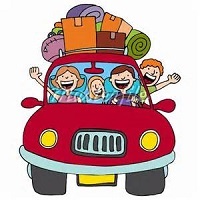 The Live Happy Challenge for today says, take a cheap road trip with your kids. Think of some place you could take the kids during a weekend, a school-break holiday, or summer vacation where the destination is perhaps less important than the journey. Make getting there as fun as possible for your tots, tweens, or teens. Pack books, games, CD's, art and craft supplies, and a big cooler filled with bottles of water, sandwiches, and snacks for the journey. Don't forget pillows and blankets for those who need naps. The point is to make it an interactive experience that your family will always remember with smiles and laughter. We used to do this all of the time when the kids were all home. Often these trips were just little day trips on the weekends. We visited the monuments in D.C. and took them to places of history. 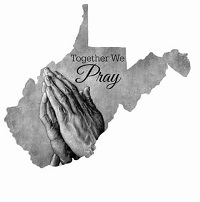 Just For Today: We are currently planning a few weekend trips to visit some areas in West Virginia. 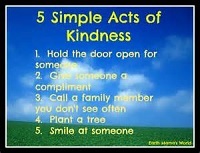 Challenge Myself: Day #161 Remember Kindness Counts! Today is Day #161 of the Nar Anon Group Just For Today Challenge. I am also integrating the Live Happy into my Challenge. The Live Happy Challenge for today says carry a bag or do an act of kindness for someone needing help. Come to the aid of someone struggling with his/her luggage. Maybe they are trying to get it on the tram to the airport and you are going their way. Or, perhaps your traveling buddy is headed back from the local flea market with his rented bike overloaded with bags. You could take one to lighten the load. Or, you see a little old Greek lady crossing the street after buying her groceries and the handle on one of her bags breaks. Don't wait for someone else to rush over and help her. You do it. And put a smile on your face. Little old Greek ladies deserve as much. Just For Today: I will help someone needing it. Did You Know That Next Week Is National Drug & Alcohol Facts Week? National Drug Facts Week starts in two days. I am planning a series of posts next week for this. I looked through my draft folder and found some really good bits and pieces of postings I started and didn't finish. Hopefully I can use next week to get some of these out of the draft folder. As parents, start the week out by opening up the discussion to your child about drugs and alcohol. Have a heart to heart talk with them. National Drug & Alcohol Facts Week (NDAFW), January 23-29, 2017 is a national health observance for teens to promote local events that uses the scientific facts from the National Institute of Drug Abuse (NIDA) to shatter the myths about drugs and alcohol. Today is Day #160 of the Nar Anon Group Just For Today Challenge. I am also integrating the Live Happy into my Challenge. The Live Happy Challenge for today says protect your money when traveling. Use a money belt. Use a money belt when you travel on vacation. You want to safeguard your money, and slipping it into a lightweight money belt that fits around your waist or inside your trousers is a far better option than carrying it around in a purse or backpack, especially if either of those have a long shoulder strap. Thieves can come up beside you, cut the strap and be gone before you realize what just happened. Pickpockets can clean your cash, credit cards, passports, and identification out of your pocket just as easily. It's a crime as old as currency itself. You want to be happy when traveling, not sitting at a police station seeking help in recovering your stolen property. Crimes don't just happen here at home. It can happen to you anywhere that you travel. Stay diligent when you are away and protect yourself from things such as this. Plan ahead. Just For Today: I will do what I have to do in order to protect myself. Today is Day #159 of the Nar Anon Group Just For Today Challenge. I am also integrating the Live Happy into my Challenge. The Live Happy Challenge for today says when traveling, pack less. Lugging a big suitcase around wherever you go can cause more than one kind of headache. Many airlines now charge you a fee to handle your checked bag(s), so traveling light makes more sense now than ever. One tip is to purchase basic travel clothing that is lightweight and washable in neutral colors such as basic black and tan that can be dressed up easily for dressier occasions on your trip. Often, that type of clothing is virtually wrinkle-free and takes up little space in a bag. Pack less, travel light, and avoid the headaches. Just For Today: When traveling again, I will use common sense when packing for the trip! We on this side of the addiction battle lines know that the disease of addiction affects many walks of life- rich or poor. If we continue doing nothing this disease will affect those who haven't even made it here yet. We have a lot of work to do in awareness to this disease. The disease of addiction doesn't care who is democrat or republican nor does it care how you vote. It can affect anyone. Yes, even those in the political spotlight. Today is Day #158 of the Nar Anon Group Just For Today Challenge. I am also integrating the Live Happy into my Challenge. The Live Happy Challenge for today says when traveling accept an invitation to dine in a local family home if you are ever invited. Do you love Russian Vodka and Caviar Blinis? The next time you are sailing down the Volga on a cruise ship and a nice Russian family invites you to dinner, don't hesitate to say da, or yes. You'll have a memorable experience dining with that family on foods that you may not have tasted elsewhere in your travels. Anytime you are visiting another region or country that is new to you, don't miss out on the opportunity to see how families live, eat, and share fellowship with their friends. After all, breaking bread together is an ancient ritual practiced in cultures throughout the world. I have never traveled outside of the United States but I want to try recipes from all over. Do you have a favorite recipe known only to your state, country or area? Please share in comment. Just For Today: Seek new recipes and cuisine. Valerie Silveira is a leader, mentor, author, speaker and consultant. Although she has had a diverse career, none of her business challenges were even close to that of losing a child over and over again to drug addiction. In 2004, Valerie's eighteen-year-old daughter was shot by her ex-boyfriend. Over the next decade, Jordan's* life spun further out of control and as a result, Valerie's spiraled into darkness. She would face the heartbreaking reality that Jordan is a heroin addict and the painful truth that she is powerless to save her daughter from her drug addiction Beast. Valerie's own Codependency Enabler Beast nearly took her down, but thankfully, she found a way to stand up and fight. Valerie is helping countless others to stand up and battle their own Beasts. She has developed a system called the Nine Actions to Battle Your Beast. 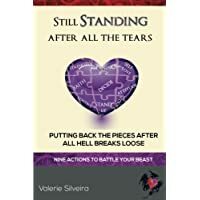 They are the Actions she used to put the pieces back together after all hell broke loose in her own life, and the Actions she still uses to keep those pieces together. *Valerie chooses to refer to her daughter as "Jordan," out of respect for her journey. Today is Day #157 of the Nar Anon Group Just For Today Challenge. I am also integrating the Live Happy into my Challenge. The Live Happy Challenge for today says to buy a bus ticket for a quick local tour. If you only have a couple of days in a town, for example New York, Chicago, or Savannah, take a bus tour and let a trained professional driver or guide show you the sights and tell you about what you are seeing. We once did a guided tour at Antietam Battlefield. It was a walking tour however. When I think of all the times we have traveled to new places in the U.S. we have never did a bus tour. I think this is a good idea. The next time we go to a new place, we will check to see if this is available. I for one would love to do the train tour in Cass, WV. Just For Today: I am planning little mini trips for 2017. Today is Day #156 of the Nar Anon Group Just For Today Challenge. I am also integrating the Live Happy into my Challenge. The Live Happy Challenge for today says to help another traveler in distress. If you notice a distressed visitor trying to figure out a map or the direction to his destination in area familiar to you, offer to help him/her. Point them in the right direction. When you give directions, write them on a card or carefully explain the distances, turns and notable landmarks. Communicate as clearly as possible. Nothing is more frustrating and, in some cases, frightening than to be lost in a new city or in an unfamiliar place. Be the person you would like to meet if that happened to you. Who knows? Your distressed traveler may be inspired by your kindness to one day help another in the same way. Remember that old adage about how one good turn deserves another. It's one way happiness can be spread. Have you ever been asked to give directions? Have you ever been traveling in an area and needed directions? Maybe you were visiting an area you know well and was able to provide help to someone needing directions? Just For Today: Remember the quote, "One Good Deed Deserves Another?" You never know when you will need someone to help you in a time of distress. Today is Day #155 of the Nar Anon Group Just For Today Challenge. I am also integrating the Live Happy into my Challenge. The Live Happy Challenge for today says, introduce yourself to someone standing in line. Strike up a conversation with someone you don't know but who looks interesting, is attractive (if you are single), seems lost, or appears confused. Help out if the latter is the case. Perhaps you are traveling somewhere in the world where you've been before and know how the trains operate or which is the best way to get to the center of plaza of the village or town. Others around may join in the conversation and this, you meet people in a group who may also be going your way. You never know until you open your mouth and engage others in conversation. Making friends on the road in new towns, villages, and cities can enrich your traveling experience. Just For Today: I will start today by saying hello to someone waiting at the time clock. Today is Day #154 of the Nar Anon Group Just For Today Challenge. I am also integrating the Live Happy into my Challenge. The Live Happy Challenge for today says, to give someone your seat on the bus, OR do one simple act of kindness in your day. You don't even have to wait until you are traveling to do this. Be a good person. Get up, and with a smile, offer your seat on the bus, train or subway to an elderly individual. It's the right thing to do. Think of the good karma you are generating. Old people are not as stable on their feet as they were in their youth. Vacate your seat and allow them the safety of sitting instead of holding onto a rail or a strap over their heads, something you might easily do. You'll feel good just knowing that you showed an act of kindness to another. And you are a better person for having done it. I have found that a simple way to show an act of kindness is to just smile even if you really don't feel like smiling. Just For Today: I will start and end the day with a smile. Today is Day #153 of the Nar Anon Group Just For Today Challenge. I am also integrating the Live Happy into my Challenge. The Live Happy Challenge for today says, loan a fellow traveler something they need. Something as small as a forgotten item can mean so much to someone else. Show a generosity of spirit to a weary or stressed-out fellow traveler by loaning him/her something they need for their trip but has forgotten, such as sunscreen, an extra tube of toothpaste, an unopened package of ear plugs, a sealed teabag, or a travel size sewing kit. Your act of kindness could cement a joyful new friendship. 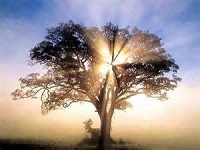 Just For Today: I will start today with a generous spirit and heart. 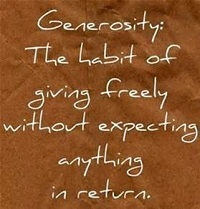 Giving when I can and giving cheerfully. Today I'm giving a shout out today to Joseph and James and The Red Hot Couch. I love the song they use for their start up. I finally caught the name of the song. 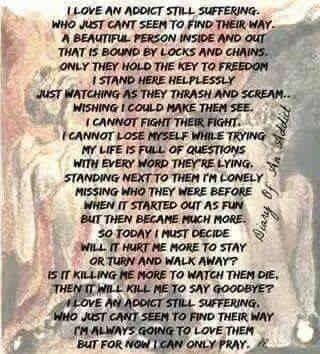 WOW what a message in the words sung. This song has become my pick me up in the mornings. To anyone struggling with addiction, you can rise up and move those mountains! OR Friend WRNR on Facebook and listen Live on their Facebook Page. Great job on your show Joseph and James!!!! Today is Day #152 of the Nar Anon Group Just For Today Challenge. I am also integrating the Live Happy into my Challenge. The Live Happy Challenge for today says before traveling to another country, buy a book on customs first. In Nepal, lying with the soles of your bare feet pointed at your host's head or images of the Divine is insulting. Likewise if you're trekking or camping with Sherpa guides don't cook meat over an open fire as they consider burning meat offensive to the gods. Before you take that next trip, buy a book that provides information about local customs so you won't risk facing a judge in a foreign land. When in doubt, always follow your in-country host's lead in terms of cultural behavior and local customs and you'll be fine. Have you traveled to other countries? What were some of the customs? Did you have trouble adjusting to these customs while visiting? Just For Today: Today's challenge has reminded me how very different other cultures are from our own. West Virginia Senator Joe Manchin is looking for stories from West Virginians on how prescription drug abuse has affected their lives. He will continue reading these stories on the Senate floor so that his colleagues, and the entire nation, can hear first-hand how the prescription drug epidemic is devastating our nation. Several months ago I wrote him about our son and how this has affected our family. His office called to talk to me. As you may of heard, Newness of Life is going to be coming to Martinsburg to kickoff a new chapter in Berkeley County. Through some talking and urging from the ...Berkeley County's Recovery Resource Coordinator, it is going to happen real soon. We utilized the new Berkeley County Recovery Resource Center to help guide us through this venture. We are excited to be working together as a team to help with the Heroin epidemic and substance abuse in Berkeley County! The reason Lazarus House was chosen as the name is because when I think about being brought back to life I can't think of a better example than a drug addict finding a newness of life without drugs and alcohol, without criminal activity, and without the feeling of hopelessness that plagued me in my addiction. Please share your stories of being brought back to life with #IamLazarus and post here on the Lazarus House page. Let's show the world that there is hope and that there ...is a better way. Our Newness Of Life Director Of Operations Kevin Bowman will be moving to Martinsburg 1/27 to begin the process of opening a new location! Keep an eye out for Newness of Life Lazarus House coming to Martinsburg real soon! This is great news for many of us in this area. 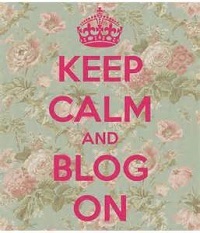 Today is Day #151 of the Nar Anon Group Just For Today Challenge. I am also integrating the Live Happy into my Challenge. The Live Happy Challenge for today says when traveling we should taste one new food or beverage from the area in which we are visiting. You are traveling. Reset your gastronomic preferences. Get into the swing of things during your visit to new places. Sample some of the local cuisine. Find a little restaurant that offers tapas, or appetizers on a sampler plate and try all of them. In the UK go for some pub grub and a pint. Ask the locals about tasty regional specialties in Greece, Turkey, or Morocco. If in Belgium or Switzerland, tantalize your taste buds with some fine chocolate. Or for a really adventurous taste experience, try some haggis in Scotland and the pickled pigs feet of northern Spain. Experiment and have some fun doing it. Do you have a favorite dish from another country? OR a dish from an area here in the U.S.? Just For Today: No matter where I travel to I will try new things! Today is Day #150 of the Nar Anon Group Just For Today Challenge. I am also integrating the Live Happy into my Challenge. The Live Happy Challenge for today says, give flowers to your host or hostess. If you've stayed in an apartment in Provence, a bed and breakfast in Belfast, or a small lodge in Katmandu, show your appreciation to your host with a bouquet. If you want to make it really special, ask your host what his/her favorite colors and flowers are. Presenting a surprise bouquet to him/her upon departure is bound to say more than your expressions of gratitude. The language of flowers speaks directly to the heart. Expect smiles. Just For Today: I will show gratitude in many ways even if it is just a flower. Like on Saturday, New Years Eve when we were shopping at Weis' Market for our peanut butter donut fix. The hubby had three in the bag and was about to put the fourth in the bag when a gentleman reached over and took the donut right out of hubby's hand and said, "I'll take that one." Really? Who the hell does that? Was he hoping for a fight? What is seriously wrong with people? Lord, Just For Today you know I don't have bail money!!! !